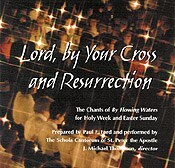 For all who wish to enter into the mystery and majesty of the celebration of the death and resurrection of Jesus Christ, the selections included on Lord, by Your Cross and Resurrection allow the themes of the paschal triduum to be heard and taken to heart through chant. This collection serves as a source of inspiration for listeners during this holiest of seasons and as a demonstration for choirs and those seeking to bring the beauty of chant to their assembly. This is the premier recording of the chants for the Chrism Mass. See the By Flowing Waters Website for more information. Paul F. Ford, Ph.D., is professor of theology and liturgy at St. John's Seminary, Camarillo, California, and chair of the Special Interest Section for Seminary Music Educators of the National Association of Pastoral Musicians. He is the author of By Flowing Waters: Chant for the Liturgy (A Collection of Unaccompanied Song for Assemblies, Cantors, and Choirs). J. Michael Thompson is the founder and director of the Schola Cantorum. He has been a pastoral musician and liturgist for twenty years, as well as a composer, author, and a noted promoter of the Liturgy of the Hours and Gregorian chant in contemporary parish situations. Dr. Paul Ford has done a fine job taking the texts for the liturgies of Passion Sunday, the Chrism Mass, the Triduum and Easter Sunday and setting them to the tones of The Simple Gradual . . . this resource could be especially useful to an assembly with limited resources.